I came across this neat little feature and instantly feel in love. We know about Microsoft Forms, the Office 365 quiz and polls tool. We know this can be easily exported to Excel. However, if you have an existing Excel file, you can use Forms to import directly into your existing Excel file! Yes. Import. Directly. Into. Your. Existing. Excel. File. I find this as a big deal. There have been numerous use cases for this over my last 20 years of consulting. People just want to collect data, in a clean manner, and then analyze it in Excel. This also comes in handy when you want to use the form for more than just a survey tool. 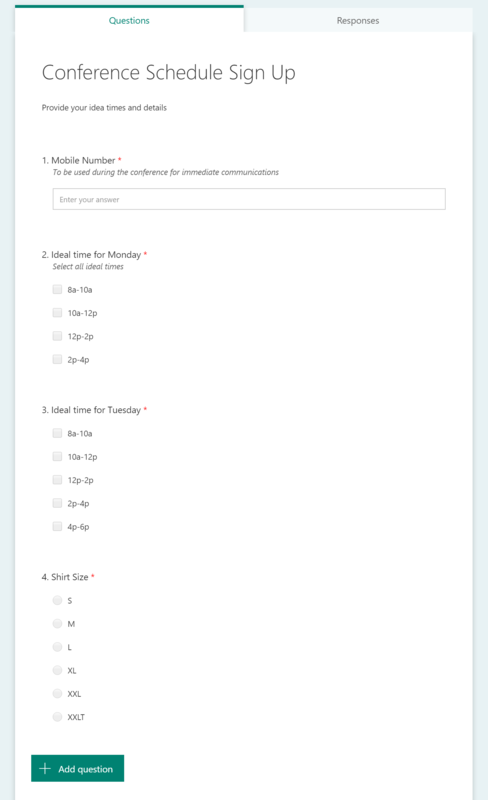 I’ve set up a Form as a request tool for the intranet. Users submit intranet requests it in Forms, it writes to my Excel file, then I can triage the request, manage that data in my Excel file, without having to download it, or writing a Flow to write the data to the Excel file. Create your Excel file, if you don’t have one already. Any Excel file will do, make sure it’s the xslx file extension (if you created it in O365 or Office 2016, you should be fine). Now throw that file up in SharePoint or Teams. Here I have a basic Excel file, with the goal of managing a booth at a trade show. I need 3 people at the booth, and I want to collect who wants to man it when. Alternatively, you can create a fresh new Excel file, with a Forms front end, from your SharePoint library! press the New menu and select Forms for Excel. Name your Excel file and you’ll be sent to the Forms designer. Will this work with OneDrive? Great question! Thanks for asking. I don’t know. Use SharePoint. I have normally used a shared Excel file in Teams/SharePoint, but for my first round through this post I decided to use OneDrive. I got through creating the form, but no results would save in the Excel file. Really weird. I’m guessing there’s a connection missing somewhere. If you try it in OneDrive, let me know how it goes!! Go open up your file in a browser. A fast way to do this is to click File menu, then click the path and click Copy path to clipboard. Close the Excel file and paste that in a browser. Any modern browser will work, I’m using Chrome. 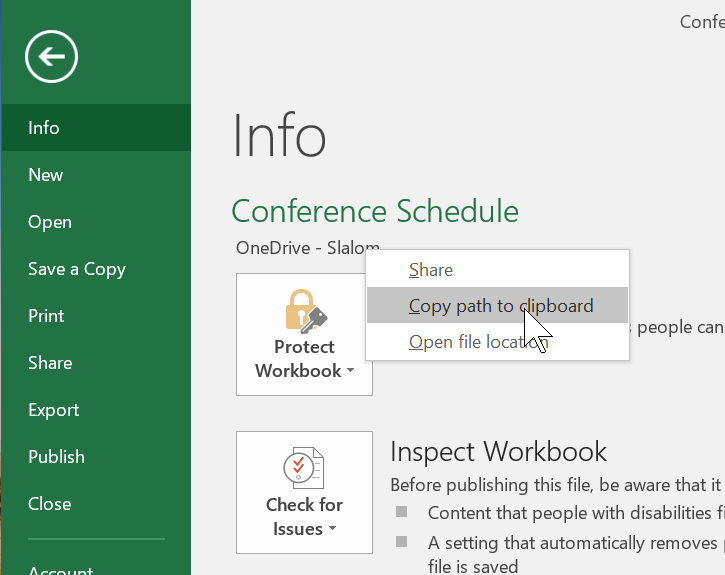 Office does support co-authoring, closing the file shouldn’t be necessary. However, I’ve noticed it gets a little wonky through the rest of these steps. Just close it, you’ll edit it in the browser shortly. Edit your file, click Edit Workbook, then Edit in Browser. Up in the HOME ribbon, in the Tables section, click Forms then New Form. This only appears in Excel Online, maybe it’ll be in Office 2019? And now you’re in FORMS!! It’s awfully nice of Microsoft to assume the same name of the form to the Excel file. Yes you can change that. Click Add Question and start creating your form! 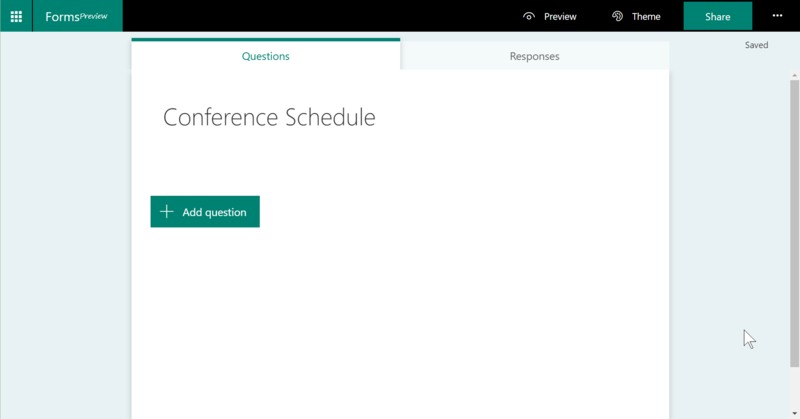 Add your first question and navigate back to the Excel file in the browser and see what’s happening. This might take a few moments to catch up, sometimes it’s immediate, sometimes I had to refresh the browser to effectively see the columns. First off, a new worksheet has been added, called Form1. Each question gets added automatically, and you’ll see a bunch of additional columns get added like Start Time, Completion Time, Email, and Name. These auto-generate, which is awesome. Yes, XXLT is a size, and my perfect size. No one ever offers it. 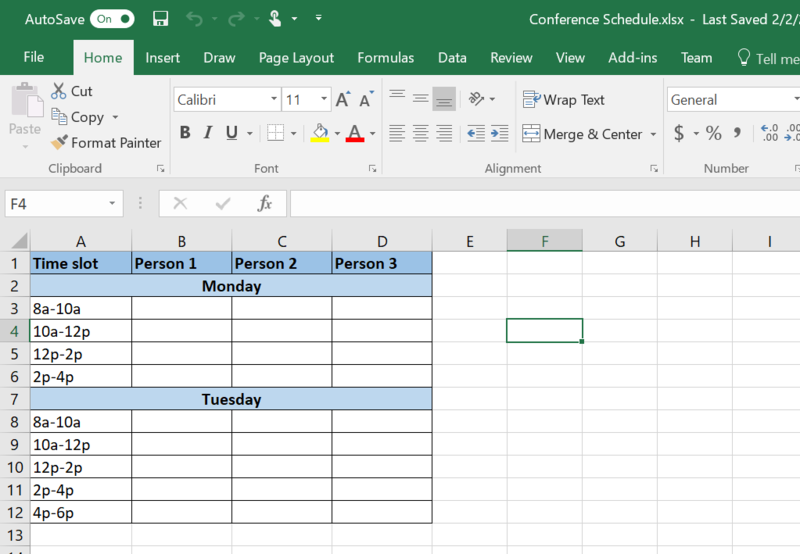 You can test it real quick, press the Preview button at the top and fill it out and watch Excel load! Once this data is in Excel, you can then treat it like any other data table. Use vlookups, functions, etc. to continue your analysis. In my example, I used a vlookup to populate the Mobile Number of each person. Now we have a single page view of who’s working the booth, when and how to reach them. I’ve noticed that the data is pushed into Excel, if you delete rows in Excel, it still exist in Forms, BUT not sure how to get it out after the fact. I deleted a bunch of rows from Excel, and they still exist in the Forms app. I think that’s great, but there doesn’t appear a way to refresh, download, or otherwise get that data from Forms. If this is a need, we can use a Flow to write the data to another datasource. 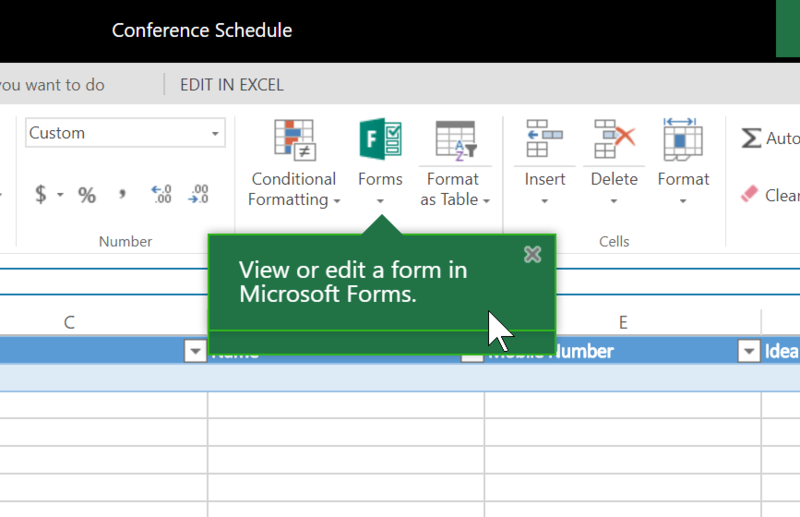 When Forms writes to Excel, the Last Modified By is SharePoint App. It’s nice something uses a service account in Office 365 (which Flow doesn’t support yet). This was relatively painless right? Stay tuned to my next post on how to add this form to Teams! Hi David. Great article! Quick question: after we submit data through the form, the data is no longer showing up in the Excel online spreadsheet. It seems as though the connection is ‘broken’. The data is still getting logged, as per the Responses continuing to increase. I can see the data by manually looking at View Results. However, it’d be preferable to have the data automatically pushing into Excel again. Please help! Thanks. Can you double check? I’ve thought this in the past but it did eventually load. Try a new request as well. sadly this is still in preview, so maybe submitting a ticket to support may help? Hi David! Super helpful post. 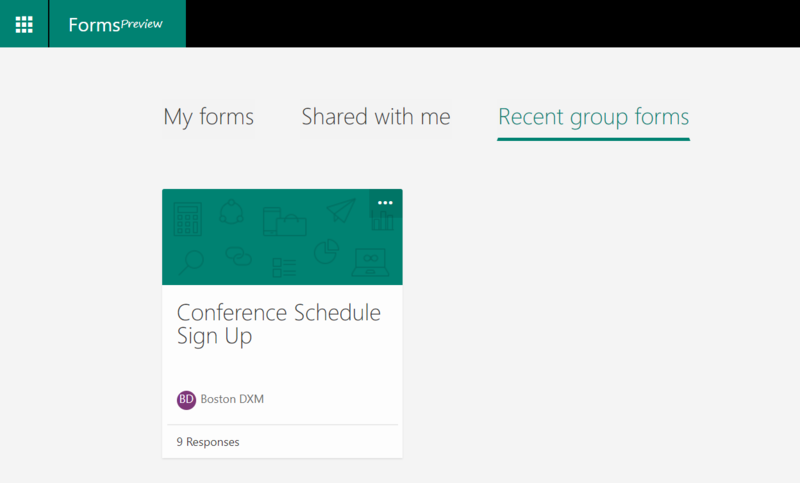 However, I’m running into a problem at the moment where the form that I create in Teams or Sharepoint does not show up in the “recent group forms” tab of Microsoft Forms. So I can access the Excel sheet and Form through Teams and Sharepoint but not through Forms. Whoa not sure why that would happen. Sorry. It’s pretty closed system not much to deep dive into. At least you can access it via Excel. Suggest reaching out to O365 support if you can. Any suggestions of how to create an Online Excel doc that syncs to an already existing Form (already have 15 responses, so don’t want to create a new Form and have to circulate a new Form link)? Any suggestions of how to link an Online Excel doc to an already existing Form (already have circulated a link to a Form and have 15 responses that’ve come through)? 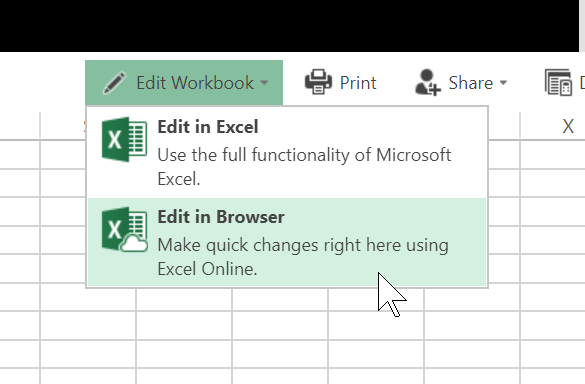 You can use Microsoft Flow to save it to an existing Excel file! how does the first original sheet gets updated , the I can see the forms sheet get the values I entered but you didn’t mention how they are both linked . They are linked by Office 365 magic. There is no actual insight into where/how they’re connected. When you follow these steps O365 makes the link. Unsure how to change it or view any more than this. Hi there! Can this work offline, i.e., no need to send data to some cloud based storage for it to get pushed to Excel? I’m looking to collect data from different people on a form displayed on the same physical offline tablet, not online. Then the data just gets pushed to the same excel sheet in the background without any risk of privacy breach (almost inevitable with free online apps) or data entry error (as with paper forms etc). Nope Forms is all online. We have a GDPR problem. After loading the responses to a Sharepoint list we would like to delete Forms responses, not just from the excel, but also from Forms too with Microsoft Flow or PowerApps. Have you any suggestion to solute this problem? I don’t know of any way to do that. I will see what I can find out. I’m trying to create a form that links to an excel that is stored in a sharepoint shared site. Have you had any experience with this? I can’t find anything else online. When you create an excel in sharepoint there is no form option, and if you create it in your onedrive and then move the excel linked to the form to sharepoint the link appears to get broken – new entries in the form no longer updates the excel. Agreed, it only works in OneDrive or Groups SharePoint sites. Doesn’t work in communication or other sharepoint sites. I’m not sure if this was already addressed, but are you aware of a way to add more than one form to an excel workbook? I would either want to combine two form responses into one workbook, or create a new form form the existing responses file. I used to do this with Google Forms for a major project that gets refreshed yearly. My company would prefer we use Microsoft this year, and I am not sure how to combine multiple forms into one workbook, which would be an essential function. I’m not sure if that’s possible. Did you try adding a new worksheet and see if the add form option is available? Hello David, This is incredible! BUT I don’t have any of those options. I work for a university and it is driving me nuts that Office did not have this feature, as Google forms synced with sheets seven years ago, but then your article was a ray of sunlight into my dark and dreary existence…. Then when I went to try it, I neither have the “new” option in my SharePoint site nor do I have the form items in my ribbon within office 365. I have talked to my IT department and they say they have the most recent updates. Do you know if this is build dependent? is it possible that we have a version of 365 that does not allow this feature? I’m sorry, I just read another post where you said this does not work in shared sites…. thank you for the heads up! I think I can still make this work! No need to reply to my other post. I’m on SharePoint and I’ve already created a form. Is there a way to have Form responses automagically record a new row into an Excel document on Sharepoint, instead of having to click “Open in Excel” each time? Did you try what was mentioned in this post? Did you encounter an error or something blocking you? Yes. My issue is that the Forms option does not appear in the “+ New” drop down menu within the SharePoint site. Also, the Forms option is not shown in the Tables section of my Home ribbon on Excel Online. 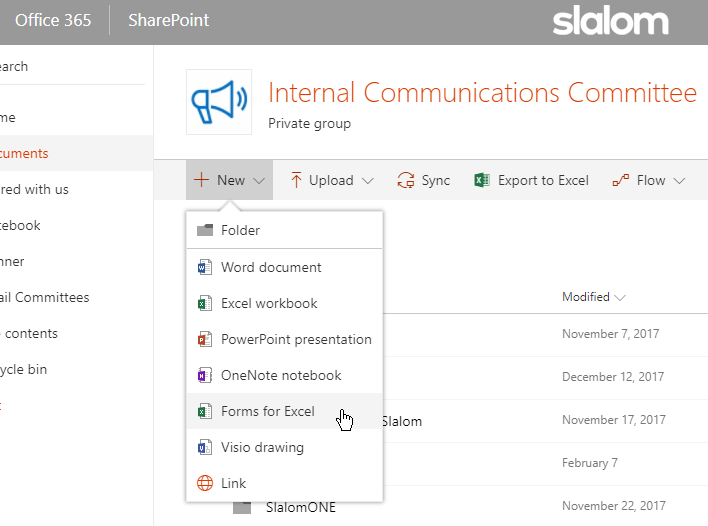 I had to create the Form under my personal SharePoint app, copy the link, and then add it to my group’s SharePoint by selecting “link” under the “New” drop down menu. It won’t appear in the + New for the site, but should within a library. I think it only appears in Excel when the Excel file is stored in library that can support it. Once it’s created, I don’t think there’s a way to get it to link back. You could create a Flow to copy the survey results into Excel! I’m sorry I’m pretty new to SharePoint. Where can I find my site’s library? How can I make the library support this capability? I just can’t seem to get it to work. I’ve spent hours trying to figure this out. Not sure how to enable the Forms option across the entire site or if it’s even possible. The Forms shows up as an option in my personal SharePoint, but not in my department’s site. I guess I’ll just have to upload the data manually each time. Do you have any good resources to help beginners with creating a Flow to copy Form submission results automatically into Excel on SharePoint? Not off the top of my head, some googling should help, and I have some more content, under the O365 menu, for Flow. However, no introduction/walk through type content. PS thanks for responding so quickly! Awesome service. hi, i created a sharepoint form linked to an excel file using the method you have suggested, by clicking on Form for Excel. I tried to move the excel file to another folder in Sharepoint but i realised that the link no longer works. So if someone fills up the form, it no longer links and updates to that excel file. :( would you know how to move and relink the form to the excel? I don’t believe it’s possible. Your other option is to use Flow to capture the data and write it into Excel wherever you wan it to go. OK, I have read this blog, and its very interesting, and I am struggling to get my Flow to add all the form info to my excel spreadsheet. Even had Microsoft on the phone, and I am unsure they have people that really understand or just read from a script, at a loss and need assistance please.